Anyone with a deli-style meat selection will certainly need to invest in extra equipment that a traditional restaurant may not. One big area of difference is with your meat slicing equipment. Choosing the appropriate slicer for your kitchen can make or break your efficiency and final product. There are a few key points to keep in mind when shopping for a meat slicer, and comparing each point to your restaurant’s needs will ensure that your choice is optimal for the job! Food slicers are used to slice thin, uniform pieces of vegetables, meats, cheeses, and poultry. A spinning round blade fixed to a flat surface helps the user to guide food products over the blade for even slicing. Restaurants of all sizes can typically benefit from a slicer if you plan on buying meats in bulk or if you want to cut out some of the labor costs and improve on precision cutting with your vegetables! Light-Duty: For the novice user, light-duty slicers are all-purpose and built for occasional use. They can be used to cut anything from veggies to meats and cheeses. Medium-Duty: While this grade can still be used to cut the same items as the light-duty type, it can be used more often but should only be utilized on an intermittent basis to prevent dulling of the blade. Heavy-Duty: For the deli or full scale restaurant, heavy-duty is the way to go! It’s built to last and can be used constantly for intense cutting jobs. 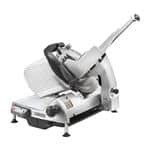 Electric: Preferable for light and medium-duty types, electric-powered slicers utilize a small 100-watt motor to power the spinning blade. Automatic: For restaurants with heavy slicer usage, automatic is essential. These beasts can crank out 60 slices/minute, making them efficient and quick! Stainless Steel: Always opt for stainless steel blades when possible for food safety concerns and well as longevity of the blade. Find a slicer with a built-in sharpener to keep your slices clean cut. Make sure that your slicer is safe and in an area that’s easily accessible by employees. Keep the blade and parts clean, and always train employees on proper use! If you’re having trouble finding the right slicer for your restaurant, send me an email or give me a call - I’d love to help guide you through the details!